A novel decentralized neural network (DNN) controller is proposed for a class of large-scale nonlinear systems with unknown interconnections. The objective is to design a DNN for a class of large-scale systems which do not satisfy the matching condition requirement. 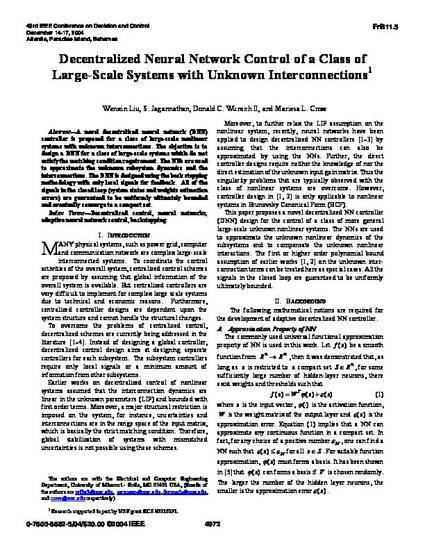 The NNs are used to approximate the unknown subsystem dynamics and the interconnections. The DNN is designed using the back stepping methodology with only local signals for feedback. All of the signals in the closed loop (system states and weights estimation errors) are guaranteed to be uniformly ultimately bounded and eventually converge to a compact set.